Her "almost-fiance" Dr. Mark Gilbert's support only adds to Shannon's feelings of guilt, since she can't bring herself to fully commit to him. She turns for help to her pastor-father, only to learn that he's just been diagnosed with leukemia. Shannon thought it couldn't get any worse. Then the late-night, threatening phone calls begin, the rough voice asking, "What did he say before he died?" I have read Stress Test by this author and really enjoyed it. While I don't enjoy reading doctor details, this book was just as great as the other! It kept my attention span from the start, and while the ending was slightly more predictable than I hoped, it was a good adrenaline rush! I really enjoyed the characters in this book and how Shannon (the main character) grows from her past and struggles. There is a tad bit of romance but the storyline is mostly centered around the suspense about the murders throughout the book. If you enjoy suspense I encourage you to read this book or others by Richard Mabry. Even if you don't enjoy medical type books these really are good! Michelle, Thanks for your review. 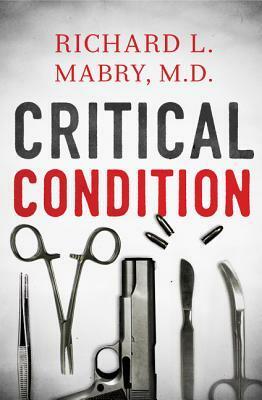 Glad you enjoyed Critical Condition, and I hope your blog readers will, as well.